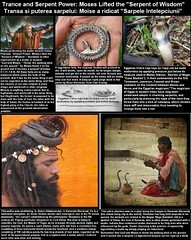 Trance and Serpent Power- Moses Lifted the "Serpent of Wisdom"
Kundalini is often experienced as a snake or serpent. God told Moses to throw his walking stick to the ground and it turned into a serpent. All these facts are so many instances which prove the truth of the proverb, that if two do the same thing it will not be regarded as the same thing: and thus the miracle of our own religion is mere magic and witchcraft in other religions. Miracle is anything contra-natural that is legitimate; and witchcraft is the same thing, but illegitimate; the former is supposed to be done with the help of God, the latter with the help of Satan; the former is boasted of as the highest glory of the Church, the latter is denounced as the greatest abomination possible. Egyptian Cobra naja haje (or haja) can be made motionless by applying pressure just below its head,(as cited in Walter Gibson, Secrets of Magic; "Case Studies"). In their commentary on the Old Testament, Jamieson, Fausset and Brown comment on the incident between Moses and Aaron and the Egyptian magicians:"The magicians of Egypt in modern times have long been celebrated adepts in charming serpents; and particularly by pressing the nape of the neck they throw them into a kind of catalepsy, which renders them stiff and immoveable, thus seeming to change them into a rod.